Agnieszka Jarzębowska is the author of epigrams and lyric poems. She graduated from the University of Lodz. Her first works were published in the pages of “Dziennik Akademicki” in 1981, whilst she was still a student. Her poems have also been presented on local TV (Telewizja Miejska Sieradz, RETSAT TV) and radio (Nasze Radio, Radio Lodz). Some of them have also appeared in the pages of “Siódma Prowincja” and the cultural magazine “Kalejdoskop”. Her first book, “Uśmiechy i Uśmieszki”, came out in 2010. This was followed two years later by the continuation of “Uśmiechy i Uśmieszki”, “Fraszkomat”. 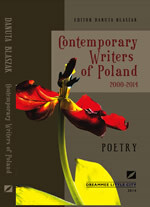 Also in 2012, she published a Polish-German book of poems, “Miejsce po przecinku/Die Stelle nach dem Komma” and Polish-Serbian “Układam siebie/Slazem sebe”. Her poems have been translated into many languages: English, German, Serbian, Swedish, Lithuanian, Slovakian, Bulgarian. and you know what Mother? if he is allowed to fly. Sometimes reaching sky too high. Hey, you will be entrapped by life’s traps. wants to feel adrenaline in the clouded sky. Up there wanting to be vigorous. by the big power of a little woman found. On the 1st of September 1939 Irene had just finished 7 and was about to go to school. Even days before the war started, the grown-ups kept talking about it. She understood little of it, thought this just meant a hand to hand combat by soldiers in colourful uniforms. In any case these were the images that she saw in the books. One day, when she was listening to the grown-ups talking, she burst our crying, when she imagined troopers fighting with their sabres right under her windows, the blood trickling. There is no water in the house and you can’t get any because the well is at the end of the backyard. – We are safe, child. First day after the war started had brought the sight of people who, after the nearby city had been bombarded, had fled to her hometown. Desperate people, sitting on the stairs, in the backyards – all exhausted and hungry. And the locals would bring them pots of coffee, soup, whatever they could. Irene’s family faced the same fate very soon. People said that close, just by the river Warta, there will be a big battle. And they fled away from the river, as far as they could. This flight was pointless but back then noone knew what to do and what will happen… German fighters were attacking the civilians and the military on the roads. Irene would jump with her family into the roadside ditch whenever she could hear the roar of the fighter. – Get up, the barn may catch the fire any moment. – Wake me up when it’s on fire. – Take the child in the red dress! She felt that someone grabbed her by her arms and hid behind the wall. There were many flights from nosediving fighters. With time, she learned what to do. For a while she stayed alone with her mother as her father went to help those fighting in Warsaw. He came back 2 or 3 weeks later. – You will go to all the teachers that we know and you will show this note. The warning has been passed on and everyone managed to flee the city. Only the school principal stayed – he thought someone needed to. The news about the planned arrests turned out to be true. The principal was arrested. Irene and her parents left the city and hid at their family, a dozen or so kilometers further. Many of the other teachers were not that lucky – they had been detained in a makeshift prison, in a factory. When the whole population of her hometown was displaced, in order to turn the area into a firing ground, the family moved to a nearby village. Mother has been giving underground tuition. She would go to pupils’ houses or pupils’ would come over – even though the mother knew she could be sent to the concentration camp if she got exposed. – I’m not even sorry for them, momma. – Let’s rejoice, dear child, the nightmare is almost over. And the life went on.